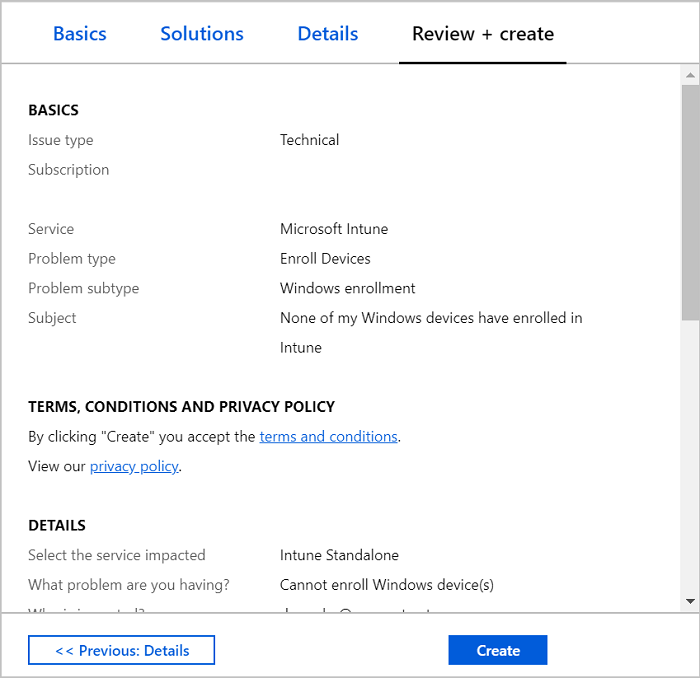 Microsoft provides global technical, pre-sales, billing, and subscription support for Microsoft Intune. Support is available both online and by phone for paid and trial subscriptions. Online technical support is available in English and Japanese. Phone support and online billing support are available in additional languages. 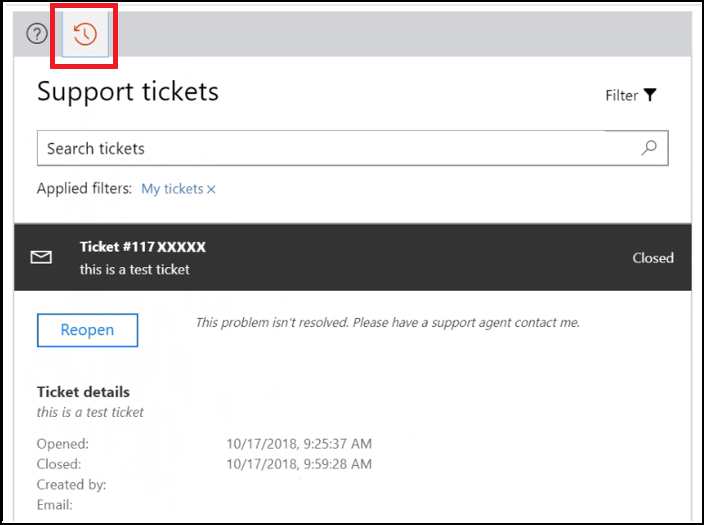 As an Intune admin, you can use the Help and Support option to file an on-line support ticket for Intune from the Azure portal. To create and manage a support incident, your account must be assigned an Azure Active Directory (Azure AD) role that includes the action microsoft.office365.supportTickets/allEntities/allTasks. For information about Azure AD roles and permissions that are required to create a support ticket, see administrator roles in Azure Active Directory. Stale user token for your account. To resolve this issue, sign out of all active console sessions, sign in again, and then attempt to create or manage a support incident. Multiple active sessions. If you are signed in with more than one user or session, sign out all but one console. Then, with a single active session, attempt to create or manage a support incident. Clear all cookies for your active browser session, and then retry creating or managing a support incident. Use an InPrivate browsing session to sign in to Intune, and try to create or manage a support incident. If the preceding workarounds don't help, go to Microsoft 365 admin center and create a support ticket from there. We are currently working on a fix that will be available in late summer. For technical support with third-party products that work with Intune (like Saaswedo, Cisco, or Lookout), contact the supplier of that product first. Before you open a request with Intune support, make sure you configured the other product correctly. 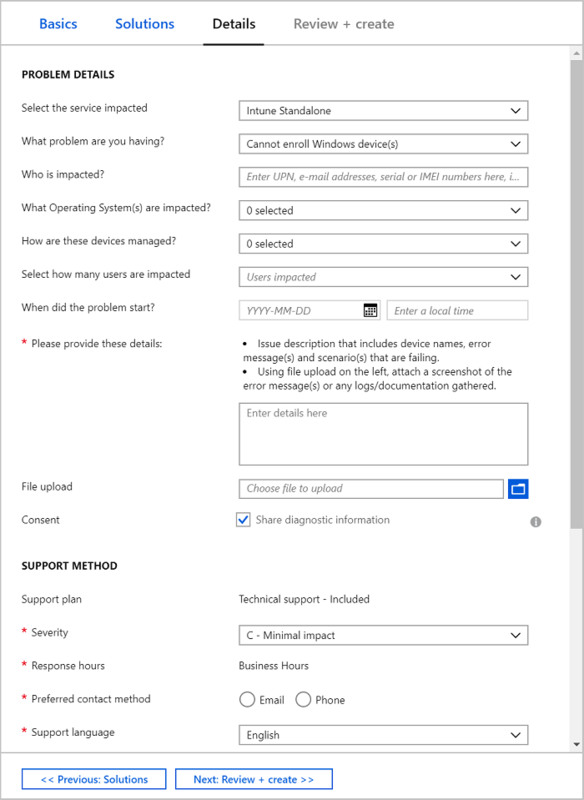 For information about troubleshooting issues related to Microsoft Intune, see the Troubleshoot section of the Intune documentation. A new Help and support experience is available for all tenants. If you do not see this new experience in your tenant, clear your browser's cache and reload the page. 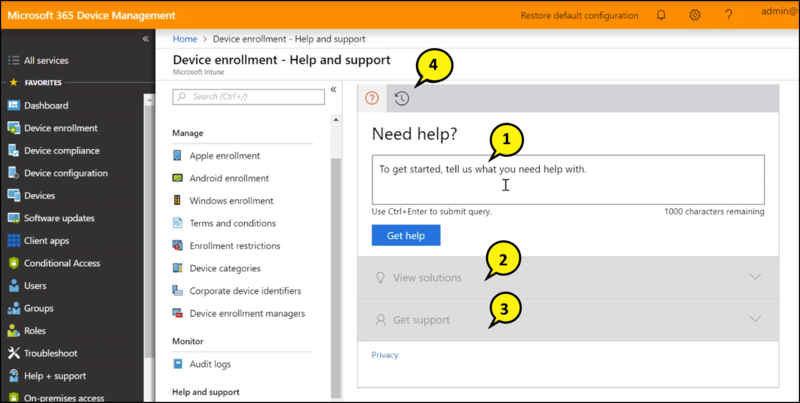 The Help and support experience for Intune is available from the Microsoft 365 Device Management portal and from all of the blades (or pages) under Intune in the Azure portal. This new experience is similar to the experience seen in the Microsoft 365 admin center, and replaces the previous Help and support experience. Selecting either the ? icon from the upper-right corner, or Help + support from the left-side navigation pane from any location in the Azure portal opens Help + support for Azure. For the best experience, use Help and support from the Intune blade. When you open Help and support from a location that is supported by the new experience, the Need help? page opens. On this page, you can specify details about an issue. As you enter details, the console offers common queries based on the keywords you use. Select an offered choice or complete your own issue description. If you enter your own description, select Get help to submit it. After you submit a query, the console returns context-sensitive information that can help to solve the issue. After you select an offered choice or submit your own query, context-sensitive results appear under View solutions. These results include both Intune specific self-help guidance and additional results returned from a web-search based on the query criteria. If the self-help or web-based guidance doesn’t help you resolve the problem, use the console to open an email or phone support issue. On the Need help? page, select the option you want to use. For an email request, provide your email address and optionally, you can add attachments to your submission. Select Send to open the request. For a phone request, provide your phone number. Optionally, you can include your email address and add attachments to your submission. Select Call me to submit the request. Select the history button to view the support incidents that you've created. Only the support cases that you open by using the new workflow are visible from within this workflow. 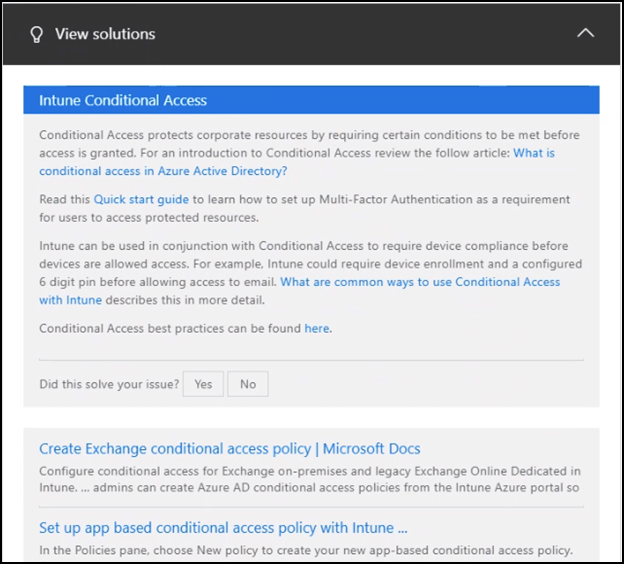 To view them, use a Help and support view from the Device Management console or from an Intune blade in the Azure portal. These cases have numbers that are eight digits long. You can also view these cases from the Microsoft 365 admin center. Sign in to Azure (https://portal.azure.com) with your Intune admin credentials, select the ? icon in the upper-right corner of the portal, and then select Help + support to go to the Azure Help + support page. On the Help + support page you can view the list of Recent support requests, and select them to view additional details. 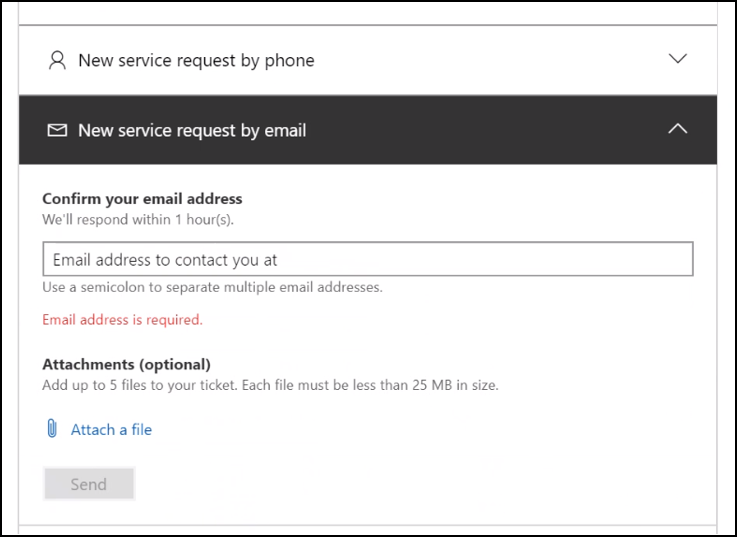 The following information describes the Azure Help + support experience which remains accessible from the Azure portal when you use the left navigation pane Help + support, or use the ? option in the upper-right corner of the Azure portal. 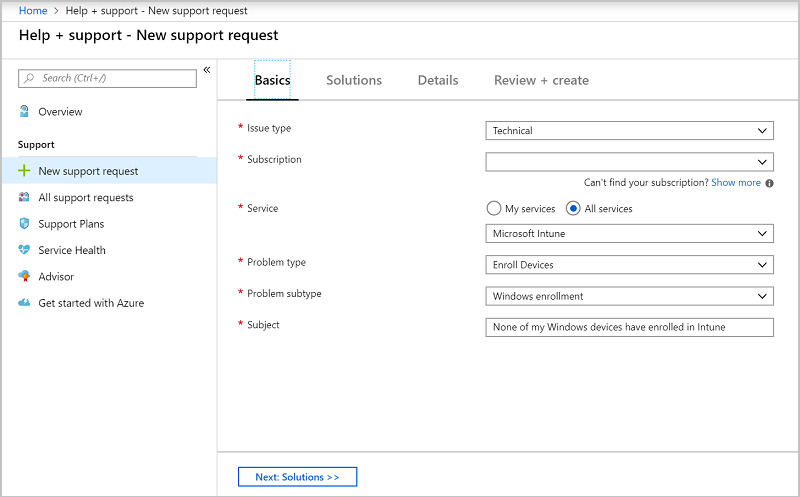 Beginning in January of 2019, you can't access the Azure Help + support experience from Help and support as found on the Intune blades. Sign in to the Azure portal (https://portal.azure.com) with your Intune admin credentials, select the ? 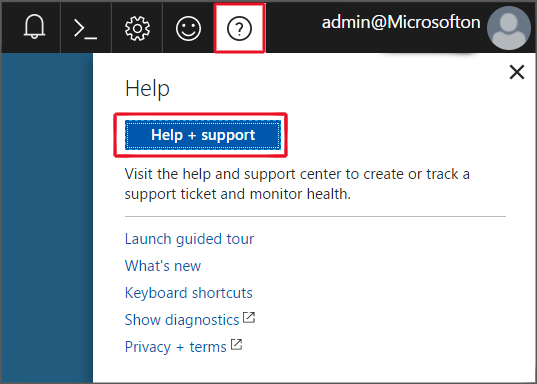 icon in the upper-right corner of the portal, and then select Help + support to go to the Azure Help + support page. 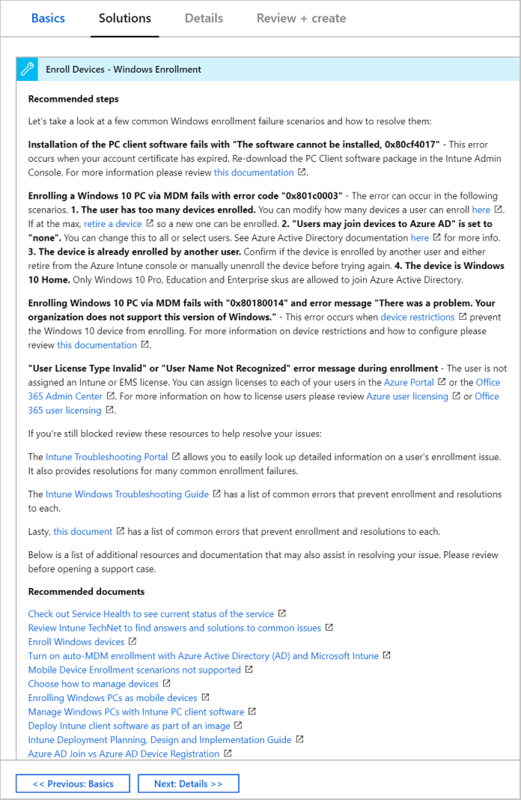 On the Azure Help + support page, select New support request. Problem type: Choose your problem type from the drop-down menu. Problem subtype: Choose the problem subtype from the drop-down menu. Subject: Briefly describe the issue you want help with. Choose Next: Solutions to continue. On the Solutions tab, review the recommended steps that might help you solve your problem without filing a ticket. If you still want to create a support request after looking through the steps, click Next: Details. On the Details tab, fill out the details for your problem, the support method, your contact information, and then click Next: Review + create. Review the information, verify that it's correct, and then choose Create to submit your support request. 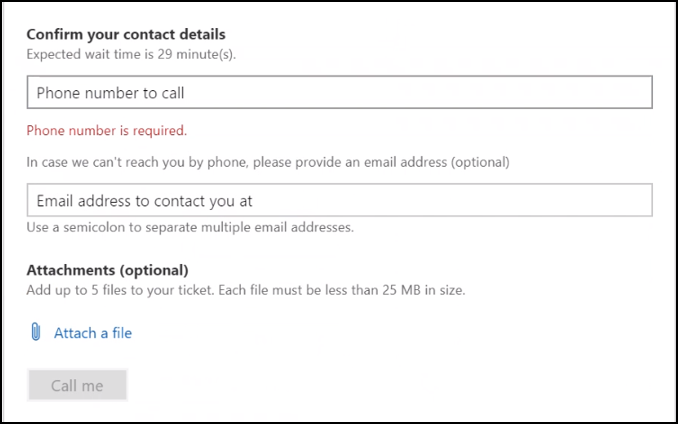 If you have a billing or subscription question, you can open a case to get support through the Microsoft 365 admin center.